It’s that time. The weather is warming up, the beach is calling and the community pools are opening. My kids spent the last seven months staring wistfully at our pool knowing it was way too cold to enjoy. Now they run to the gate excited every afternoon to get jump in. When we bought a house with a pool, I pictured casual afternoons spent by the pool watching my happy children swim. I didn’t think about all the things you need for a successful swim day. Over the years I’ve gotten it down to a pretty good system, but if this is your first (or second, or seventh) summer spent at the beach of the pool and you feel like you still don’t have it all down yet, don’t worry. The Salty Mamas have got you – and your kids – covered with these must haves for a day at the pool! Full disclosure: Goggles are the bane of my existence. My kids love to wear them and hate to keep them on their face. They tug at them, put them up on stop of their head, and just plain take them off far too often for my taste. So after trying literally dozens of different brands and types of goggles, I’m ready to announce that Finis makes my absolute favorite goggles! They stay snug on my kid’s face so as to not let any water in, and the double band behind the head makes them stay on much better than a single strap. Plus, the kids look so cute in them! 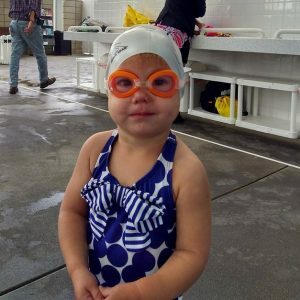 If you’ve got kiddos in diapers – or just under a certain age depending on where you’re swimming – you’re going to need to grab some great swim diapers. My personal favorite for swim diapers are from iPlay. They are super cute and come in lots of great prints. They also have snaps on one side to help get them off of your squirmy, slippery, wet babies. Plus, they’re so adorable on. You can put them under a bathing suit, with a swim shirt, or even just wear them solo. You may want to size up, as they can run a little snug! Another great reusable swim diaper is made by Happy Nappy. I love this swim diaper because it’s made of neoprene (think wetsuit material!) which is awesome because it dries easily and I can just wring it out after use, roll it up, and reuse it! It also is nice and snug around the waist and the thighs, so you can be confident there won’t be any leakage. If your kiddo isn’t water safe yet, you’ll want to grab some floaties to help them swim, and you relax. Thankfully, floaties have come a long way since the flimsy inflatables that you would slide onto baby’s arm (and then pray would stay there). There are lots of different options out there, but our favorite floatie is the classic puddle jumper. Easy to use, safe for the kids, and it takes such a load off when you’re worried about your little one in the water. 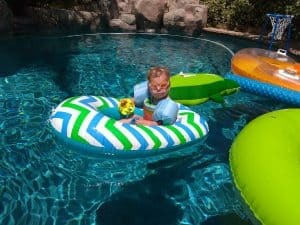 The best part – besides keeping them afloat – is that it doesn’t get in the way of their fun and gives them the mobility to climb in and out of the pool, play with pool toys, and enjoy their time in the water. Even if they are just floating around in a boat! Yes, the pool is fun enough on it’s own, but there are some great – and affordable toys to amp up the fun this summer! These are our favorite pool toys. One of the most classic pool toys, rings still hold up! My kids love them. Whether it’s my son diving to the deep end, or my toddler braving the steps to put her face underwater to grab a ring, everyone can play! You can go with a super classic set of rings, or go a little more festive with these fish shaped rings. My toddlers favorite pool toy is this Melissa and Doug Lobster claw game. She can use the lobster claw to pick up toys without having to go underwater herself. So she gets to play like the big kids, but in a way that feels safe for her. These Float and Play balls from Munchkin are also great for pool or bath! Of course, you can’t go wrong with a shaded baby float. We love this one because it creates a splashing area for baby too. You’re already going to bet wet, so turn up the water with some fun waterguns! If you want a classic gun style, we like these high capacity water guns that can shoot up to 35 feet. We love this water blaster set! They pack a mean punch with lots of water and are covered with a pool noodle foam just in case your kids are as adventurous as mine! Sunscreen is a hot topic these days. You can lather your kid in something organic, you can go with an old standard like Coppertone Baby, or you can even make your own! 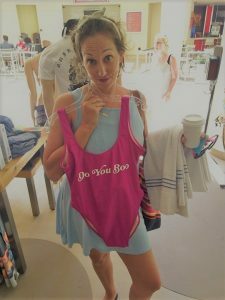 Much like our opinions on breastfeeding, the Salty Mamas are team “You do you, boo!” Grab whatever kind you like that keeps your kiddos burn free, and cover those babies up! Don’t forget to repeat all the time. You don’t think about drinking water when you’re spending the whole day splashing in a giant vat of the stuff, but it’s so important to keep our little ones hydrated on pool and beach days. My kids are big fans of very cold water, which isn’t always easy to come by in the sweltering summer heat. For a while we used my stainless steel Hydro Flask but more often than not the kids would end up spilling – and wasting – all that wonderfully cold water. 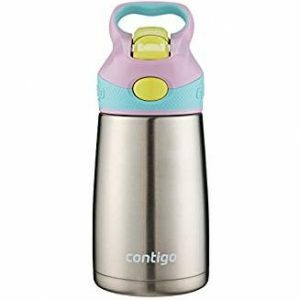 Then I found Contigo makes this stainless steel kids water bottle with a straw which is amazing and a must have for summer! Yeah, yeah, yeah, we just got the kids a LOT of stuff. And while we’re totally not ashamed to flaunt our rockin’ and rollin’ (emphasis on the rollin’….) Mom Bods because our kids love us the way we are, we also wouldn’t turn down a cute cover-up. I love something fun, simple and affordable and this cover-up checks every box! 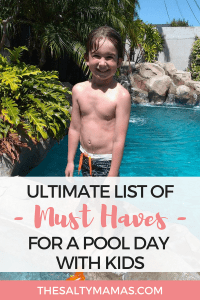 Here’s to hoping you have a summer full of sun, fun, and that this list helps you find everything you need! Couldn’t get all the kids to the pool with out the puddle jumpers! Definitely reduce all the mama anxiety when bringing my horde of small children near water. I’ve considered them for bath time too. Things are always getting too crazy for my liking with five boys at bathtime.